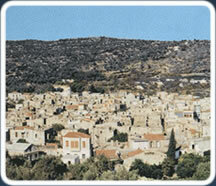 Kalamoti is located in the southeastern side of Chios. 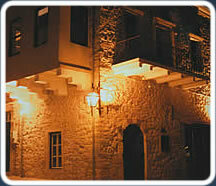 It is a medieval village with a rich architectural heritage, tradition and history. It is believed that the village was built, at its present location, by the "Genuates" (Genoese) towards the end of the 14th century. The main and distinctive features of its urban planning were the closed four sided shape, the continuous, unbreakable defense wall adjacent with the outer walls of the houses, the few narrow roads, the small dimension of the public use areas, the absence of trees, the various churches and the stone-built facades of the houses. Their structure constituted a guaranteed defense and protection from invasions by pirates. Agriculture has always been the main occupation of the inhabitants of Kalamoti. The main products have always been masticha (gum), oil, cereals, cotton, anise, figs, and almonds and later - after 1922 - tobacco. Kalamoti was a minor community until the first years of the 20th century. However, the advances in technology and science brought new principles, customs and ways of behavior and at the same time have improved not only the standards of living but also the appearance, structure and occupations of its inhabitants. The construction of the Preliminary and High School, the "Grigoriadio" aqueduct, the use of electric power, the construction of galleries, paved roads are some of the projects derived from the village's upgrading and were materialized by the cooperation, the love and the desire of the villagers for continuous prosperity and progress. Kalamoti has always been the cultural and administrative center of the "Masticha villages", due to its geographical position, as well as due to the aptitude of its inhabitants for science and progress. Many of its villagers have graduated from universities and possess high positions in the public and private sectors. 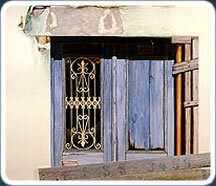 Nowadays, Kalamoti has approximately 600 inhabitants mainly old aged ones. The lack of basic amenities and the problem of abandonment and devastation threaten the future of this historical village. 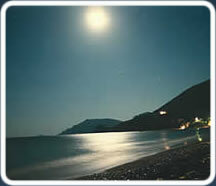 The maintenance and exploitation of the medieval side of the village and the touristic development of the beach of Komi, in combination with the protection of its natural habitat are the leading points for the survival, the historic continuation and the future of Kalamoti.